Troydm found the series in question, posting as much in the comments, but has not posted an answer, so I'm putting one up so that we have an answer. 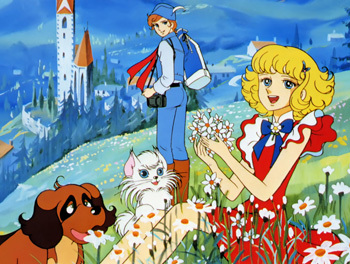 Hana no Ko Lunlun (花の子ルンルン) is a Magical Girl series from 1979 focusing on a theme of flowers. Long ago, plant spirits and fairy-like creatures lived in harmony with mankind, but gradually humans began to rise toward greed and cruelty and the plant spirits immigrated to another world they dubbed the "Flower Star". However, their legacy remained in people who truly knew the meaning of love and kindness, and not to mention some plant spirits that still believed in humanity remained on Earth and married human people, thus leaving some blood descendants scattered around the world. A talking dog and cat pair, Nubo and Cato, are sent to Earth to find one such descendant to find the magical Flower of Seven Colors, the symbol of the Flowern Star's ruling family, so that a new ruler can ascend the throne. In France they meet Lunlun, a young orphan who lives with her paternal grandparents who own a flower shop. She turns out to be a descendant of the Plant spirits from her mother's side, so on Lunlun's 15th birthday party, they ask her to join them, and she accepts. They travel all over Europe in search of the flower, helping people every step of the way, while being pursued by a bumbling pair of villains, the selfish fairy Togenishia and her servant Yabooki, who want to steal the flower and rule the Flowern Star. Lunlun is also aided by Serge, a mysterious photographer who gives the people Lunlun helps packets of flower seeds which symbolize the lesson they've learned in the "language of flowers." For the Russian dub, it was probably released as Лулу — ангел цветов or "Lulu - Angel Flower". There were 50 episodes of 24 minutes in length and a 15 minute film, Hana no Ko Lunlun: Hello Cherry Garden.